Click here to get unbeatable price for this hotel. 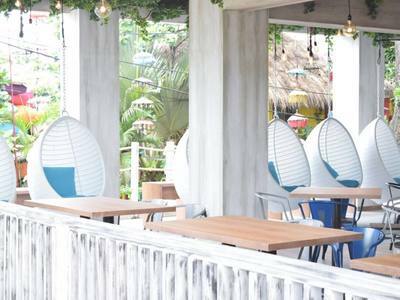 PURI SARON SEMINYAK is just one of them that stand out on all respects. 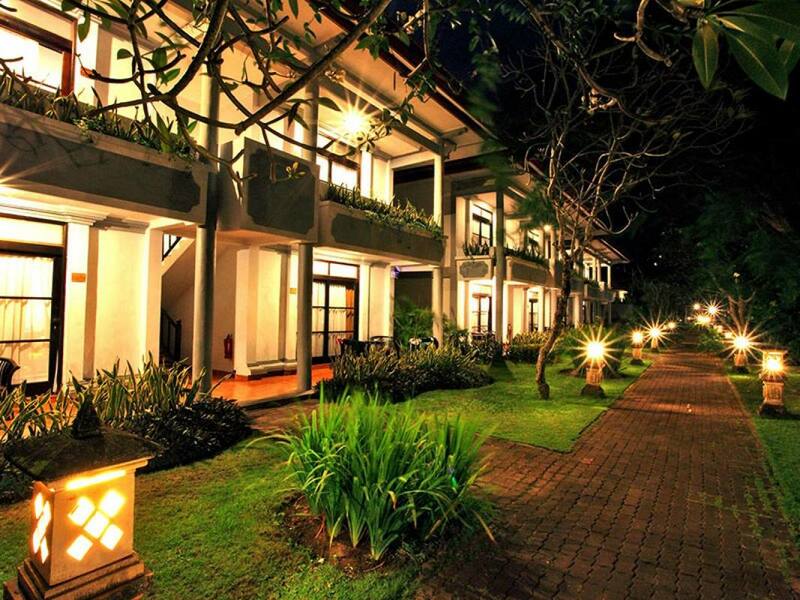 It is a hotel that encompasses all the conveniences that you require. 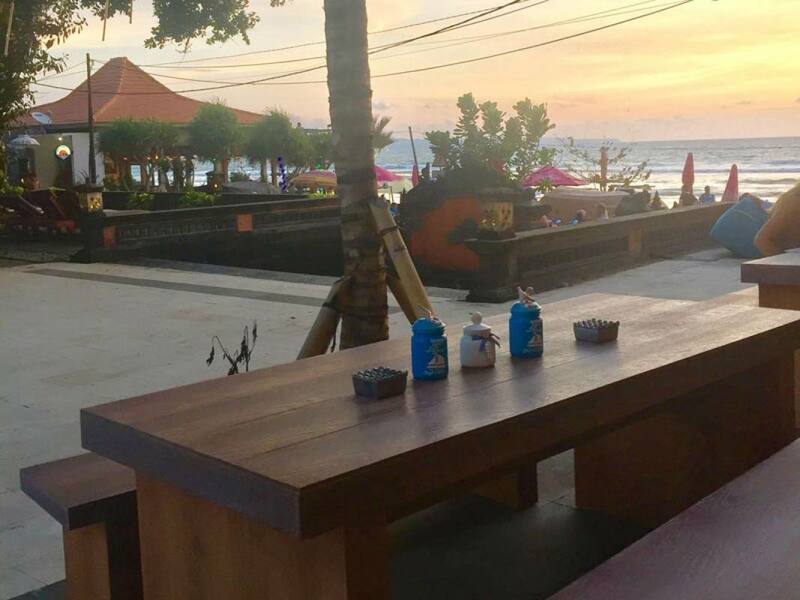 Kuta in addition to being the Sunset Site Number One, with its daily spectacular sunsets, it is the centre of night life activities in Southern Bali and a shopping mecca. Puri Saron Seminyak Hotel is convenient and Each rooms is well designed to mix Balinese traditional atmosphere and modern facilities to suit the tastes and preferences of the global visitors. 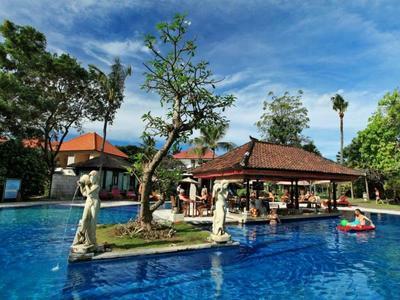 The most suitable choice for families with children and groups, most with private balconies featuring views of the resort’s lush tropical garden. bedding configuration and some with interconnecting room facilities. with contemporary teak wood furnishings. 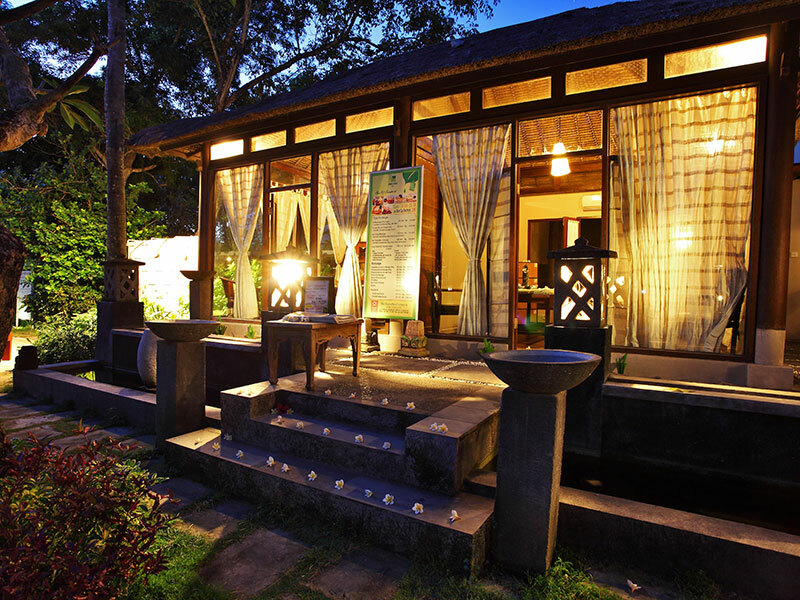 All rooms feature private terrace with tropical garden view, bathtub and shower. 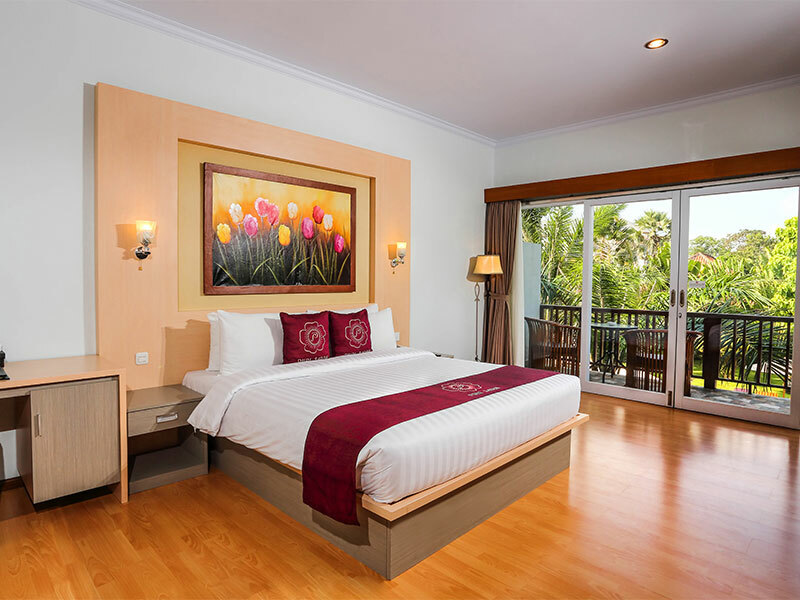 The rooms are spacious with bedding configuration of one queen bed. A honeymooner’s sanctuary. Located on the top floor, facing to the beach and pool. 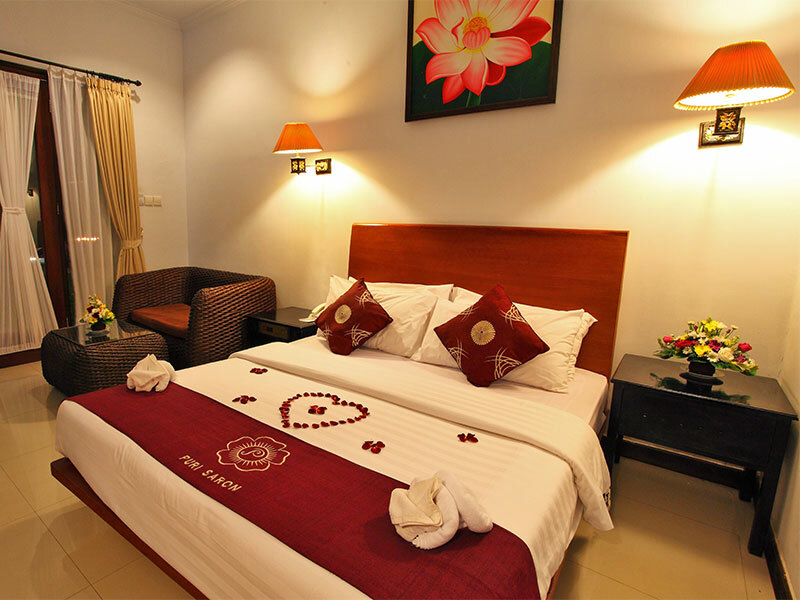 Most of the Super Deluxe rooms are furnished with an elegant queen size bed. 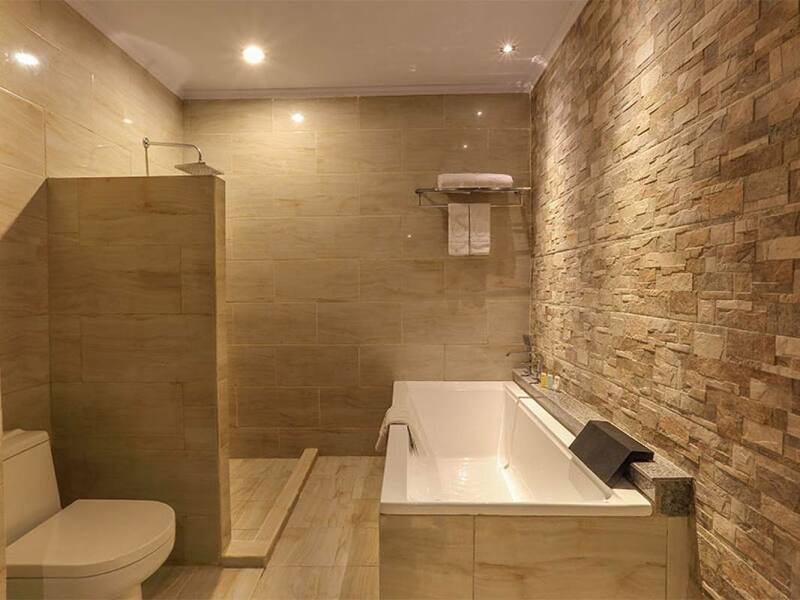 Every room has luxurious parquet flooring with spacious private bathroom, bathtub and separate shower area. 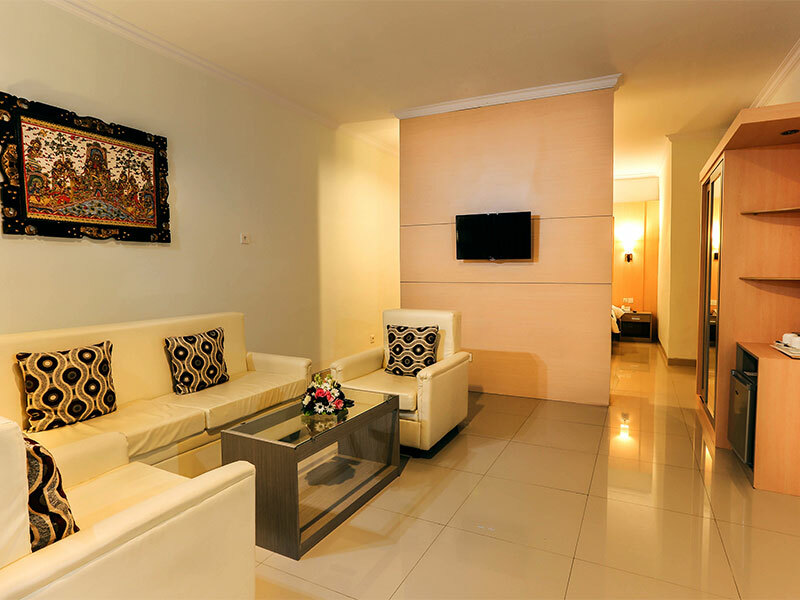 Every room is unique, decorated in warm colors with unique pieces of furnished furniture. 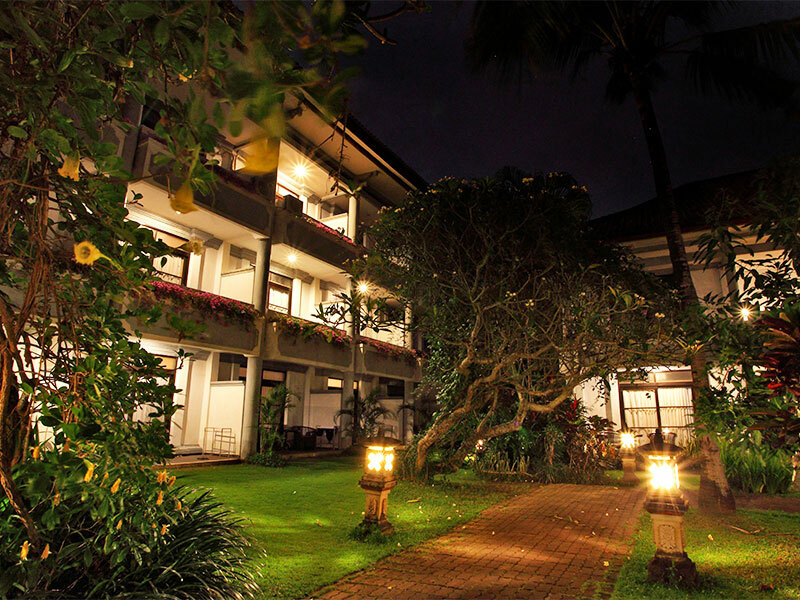 Large appointed room with beach and pool view, spacious sitting and lounge area with parquet tiles and wooden furnishing. The Junior Suite has luxurious bathroom facilities, a private balcony and shower. 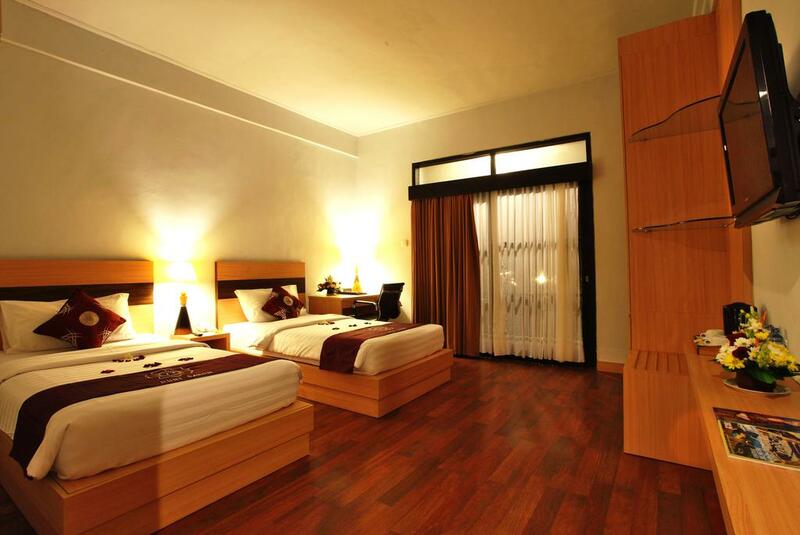 a spacious bedroom and bathroom, indoor bathroom. 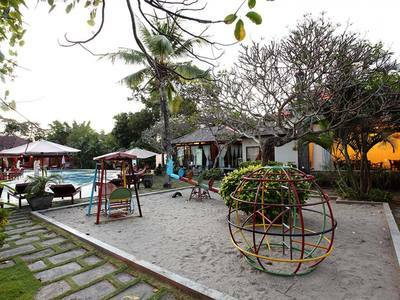 Each villa opens to its own private pool, garden and wooden terrace with sun lounger chair. Every villa has a spacious outdoor sitting and lounge area so guests can savor the balmy ocean breeze in quite privacy. 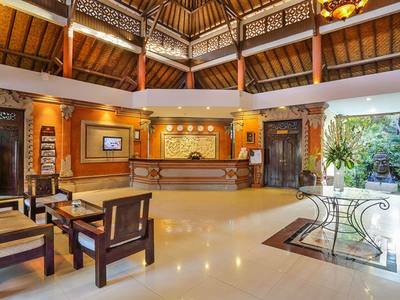 Puri Saron Hotel in Seminyak features a wide range of services that would surely facilitate the guests. 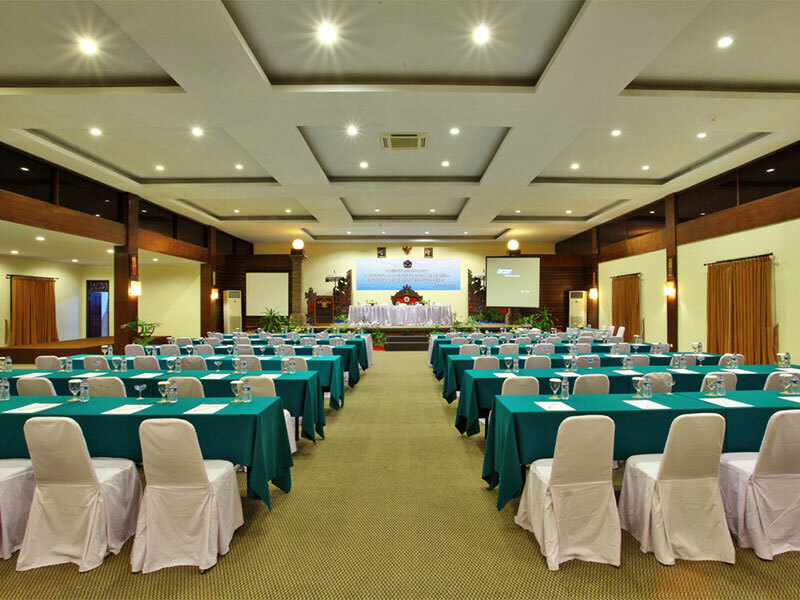 The hotel amenities at the Puri Saron Hotel include conference facilities, baby sitting services, room service, currency exchange facilities, ticketing office, faxing facilities, swimming pool, laundry cleaning service, restaurants, cafe and a bar among other services. 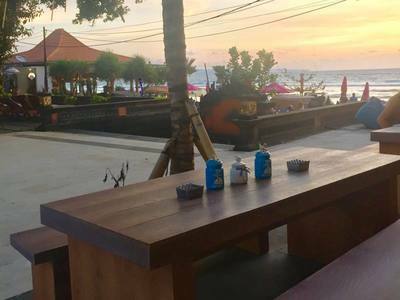 We provide Two Dining Facilities, Mawar Saron Restaurant which located on the side of the beach. Enjoy swimming with our Sea-Side Pool, you can see the Beach view from our pool. 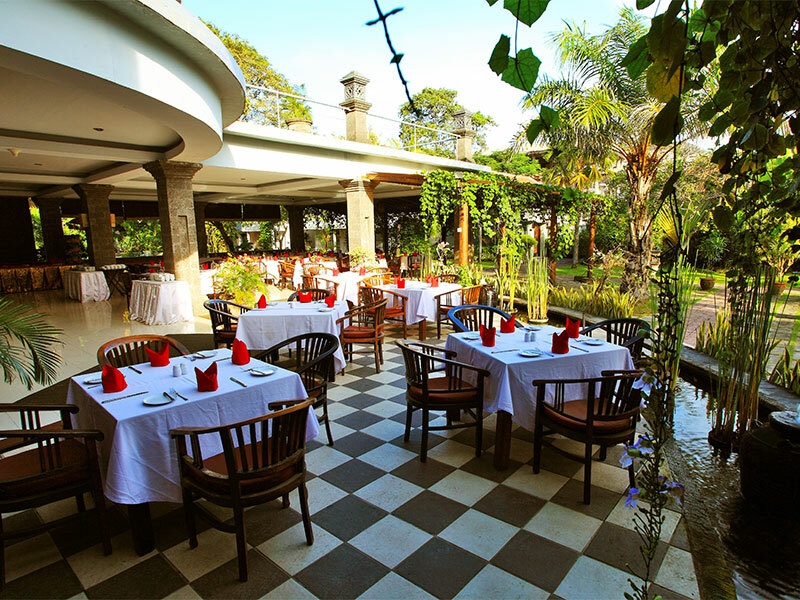 Amidst the rooms we have a beautiful garden with all kind of tropical vegetation and an abundance of exotic plants. We are famous for this well cared garden all over the world.